DataTrack has developed BreezeFigs, a speed figure system that analyzes stride length and other factors displayed by horses in motion at 2-year-old sales or at racetracks (in races or morning breezes) to select the most promising racing prospects. From over 17,000 horses analyzed, BreezeFigs' top selections include nearly 80% of all stakes winners to emerge from the major 2-year-old sales in North America since 2005. Daily Racing Form has incorporated BreezeFig as part of its DRF-Plus on-line handicapping services to select the unraced or lightly-raced horses with the best chances to win races. The photo to the right features a horse with BreezeFigs measuring lines simulated. These measurements are then calculated to determine stride length, efficiency and overall BreezeFig for each horse and are visible by clicking the video directly to the right. BreezeFigs have been successfully used to determine quality not only in the United States, but also in New Zealand, Great Britain and France. The components of BreezeFigs separate every horse in every breeze show into one of four Groups based on how well each horse scores on overall BreezeFig, stride length and certain angulation and efficiency scores. Group 1 and Group 2 are basically equal except that those in Group 1 have an additional component that lifts their rating slightly above those in Group 2. Groups 3 and 4 are considered to be more inefficient and not likely to achieve success in quality races. The objective is to identify for buyers at the sales those horses which are the true overall athletes, not just those that have the fastest times; and to tell handicappers which horses in what races are most likely to win a race-especially in their first starts. 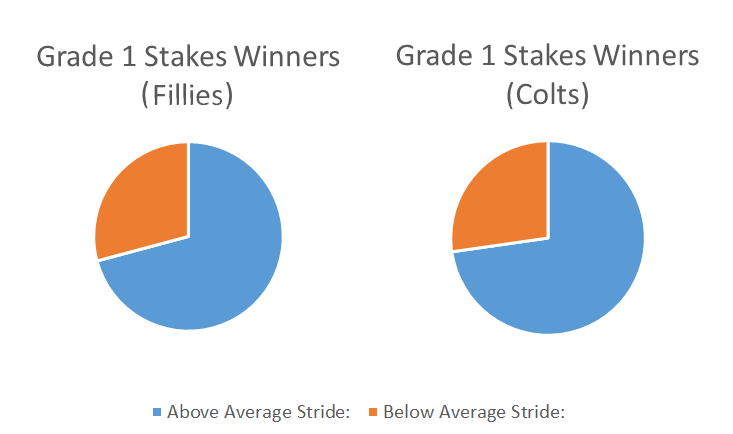 The chart on the right shows how horses which breezed at the major 2-year-old sales from 2007 to 2013 have succeeded in winning Graded Stakes through June 2014 according to the BreezeFigs Group in which they ranked on the day they breezed at a sale. How BreezeFigs fared vs our competitors in Thoroughbred Daily News' Fantasy Stable competition, click here. For complete details on how BreezeFigs works, click here. For the HRTV interview with Jay Kilgore regarding stride lengths at 2-year-old sales, click here. BreezeFigs makes the news again! Click here to check out the article from Jay's most recent visit to New Zealand! View Jay Kilgore's Presentation on Gait Analysis here.